This entry was posted in Home, Minimalism and tagged apartment living, clutter, home, simplify. Bookmark the permalink. Our breakfast bar is the biggest collector of misc. junk in our home, largely due to our son. He gets one, ceramic bowl that matches the kitchen to put little things in like gum, keys, small tools, hardware pieces from his projects, earbuds etc. When it gets full, it overflows onto the counter along with magazines, glasses and whatever else he sets there. Asking him to sort it out is too overwhelming for him, so periodically (with warning) I dump everything in a plastic bag and put it in his room. Yes, he has a few plastic bags of stuff in his room! I do remove his glasses, earbuds and car keys, but the rest he can usually live without. Or if he really needs it, he can dig through the plastic bags. That’s such a great idea. I sometimes do a similar thing in my own home – I’ll take everything off the coffee table and put it in a corner in my bedroom for sorting later. That’s not always a great idea, because I don’t always get to it…but it does help keep highly visible areas nice and clean! Isn’t it nice to look over and see a nice clean surface? Thanks for sharing Lisa! These are all great suggestions – my husband is like you and tends to toss things wherever there’s an open flat surface. It drives me crazy! I like to have a place for everything, and put said things back in said place. So I’ve tried minimizing the amount of open flat areas in the home as well. As far as all those extra cups and how they seem to end up everywhere….. we got rid of a lot of our dishware. It’s just the two of us here, and we don’t use our dishwasher, so we only keep 4 of everything in the cabinets. It keeps us on top of the dishes, and it means there are less things that are likely to end up all over the house. Of course, we have more beer glasses than I can count on both hands…. 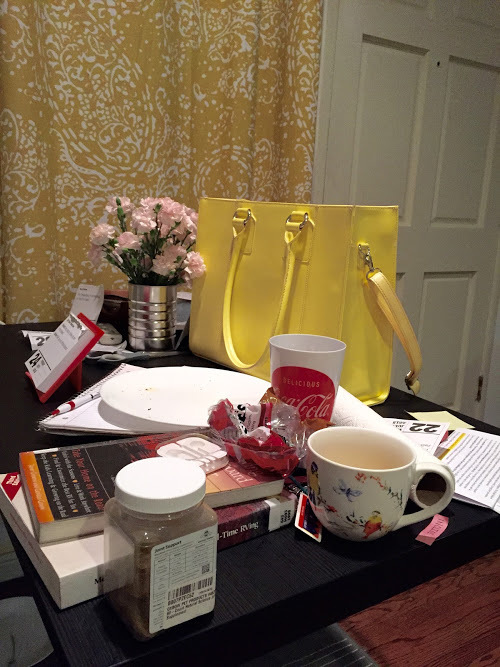 I can imagine – I actually thought it was my husband who was messier, then I started working from home…yeah, I’m the messy one. Getting rid of dishware is a good idea. Right now I feel like we have just a few too many cups (I think we have like 9 or 10?) We wait until dishes build up and use our dishwasher, but it would be better to just handwash a few things at a time and skip the dishwasher (at least from a clutter standpoint). I used to have a couple dozen coffee mugs…when I lived alone. I just love them! But then I realized how much space they were taking up and how little use I actually got out of them. I still have about 8, but I cherish each one for a different reason. I definitely have clutter spaces and drawers and I don’t like clutter! I’ve had to take time to open and empty each and every drawer because I’ve found that it’s the only way to truly assess what lurks in there! Those cube storage bins are another trap for me! They really can “just happen” especially if you’re not aware that they’re beginning to build up. Something I’ve thought a lot about (and may do a post on later) is simplifying where no one can see – so, drawers, tubs, closets, etc. They really are places where clutter goes to live on forever. Surface clutter is pretty much under control here, except for a part of the kitchen counter (???) which is a magnet for cellphones, keys, coins, receipts, etc. I had a decorative dish in the hallway especially for these items, yet they ALWAYS end up in the kitchen. So today I moved the dish into the kitchen. Here’s hoping the items will stay IN the dish and no longer roam the kitchen! That’s a great idea – it’s so funny where you can find cups. And the kitchen is such a central part of any home/apartment that I feel clutter naturally gravitates there. Along with all the dishes…Thanks for sharing some tips & for reading! Kitchen counter for me too! I find I put thing there that need action – bills, lists, things to fix or thing I just don’t know what to do with. So my problem is about getting round to putting that picture on the the wall or making that dentist appointment etc etc. I found my surface clutter problem improved 90% when I de-cluttered my cupboards. Things go away so easily and everything has a home. With teenagers, I regularly sort the clutter (dropped clothes usually!) downstairs into piles which I put on the the stairs – take it up when you go. With small children I used to keep a basket each for them which I dropped little things into..
My bug bear is shoes. In the middle of the floor. And my son has big feet – Big shoes! And he has too many pairs of shoes…. Yes, I agree – clutter builds up when it’s a lot of “someday” things. It’s funny how little time these things actually end up taking, but yet we let the clutter bug us for days before taking care of it. Those are some great suggestions! I used to have too many shoes, and my first step in cleaning the apartment would always be putting away the shoes. It was always shocking how big of a difference that made. Love this! I’m glad I’m not the only one with this problem haha. For me, my desk and my ottoman are those places. I need to get it together–great suggestions! Thanks Paige! I’m pleasantly surprised to learn through all the comments that there are plenty of us with this habit 🙂 Thanks for reading! Hi Emily! As a family of 5 we have several different “hot spots”. I’ve declared a couple areas “clutter free zones” and that has surprisingly worked to keep them free of clutter. 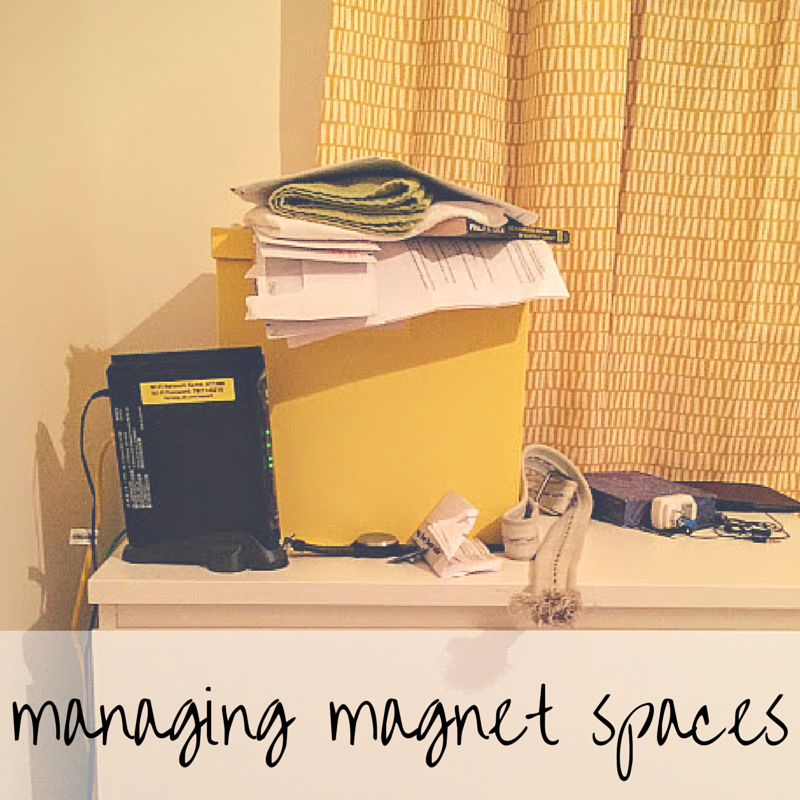 Of course, if you looked at other areas you would see that our flat surfaces are also clutter magnets. Thanks for a great post. That’s SUCH a great idea! When I clean I like to take everything and put it into one place first so that I can get an immediate sense of relief in the other cluttered areas. Thanks for sharing! Hah! Yes, it’s a tough habit to kick. I’m glad that there are others like us 🙂 Good luck & thanks for stopping by to leave a comment!